Google has set aside a $25 million pool to fund research work by schools and other organizations using machine learning for "social good." Besides cash, the company's "AI for Social Good" project is also offering support from its artificial intelligence experts, credits and consulting from Google Cloud. Those chosen will also join a "launchpad" accelerator program with mentoring, support and access to Silicon Valley experts. Daniel de León was pursuing an associate's degree at Cabrillo College in Aptos, CA, when he was invited to serve as an intern at nearby Monterey Bay Aquarium Research Institute in Moss Landing, CA. There, he helped researchers figure out a way to analyze a massive amount of data they were collecting through the use of an underwater "hydrophone" that captures the communications of ocean mammals and, particularly, whales. De León, now an engineering student at California Polytechnic State University, learned how to convert the audio files into images of sound and feed those into a TensorFlow model to teach it specifically what blue whale and fin whale calls look like. By the end of his internship, he had fed 18,000 examples of whale calls into TensorFlow, enabling it to learn how to identify calls from those specific whales with an accuracy of 98.05 percent. Two high school students turned to machine learning to help analyze data about biomass to determine whether or not it's "dead fuel," ripe for feeding wildfires. Aditya Shah and Sanjana Shah (unrelated) are students at Monte Vista High School in Cupertino, CA. The device they've created will enable Cal Fire, the state's firefighting agency, to get an early look at the most vulnerable spots for possible wildfire. 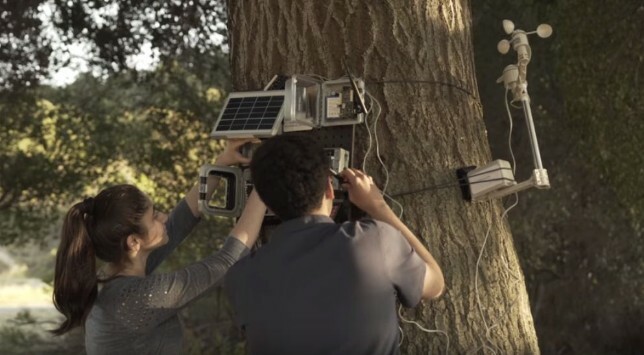 Used in a network of sensors, the "smart wildfire sensor" device could enable fire prevention crews to get the data they need without having to visit the forest areas in person to collect samples and classify them manually. The students used TensorFlow to train their model to recognize dead fuel (defined as downed leaves and branches with a moisture content of 0 percent) in images with an accuracy rate of 89 percent. The capture of images continued during the summer, using ground and aerial drones, with the expectation of further improving the prediction accuracy. Projects seeking funding need to address a societal challenge and have a clear plan to deploy the AI model for real-world impact. Organizations will have until the end of January 21, 2019 to submit their applications. Those will be reviewed by a diverse group of experts, including Jeff Dean, the senior vice president in charge of Google AI; Ayanna Howard, the chair of the School of Interactive Computing at Georgia Tech; and actress Geena Davis, who chairs an institute on gender in media. Google has pulled together a set of resources to help people who have an interest in applying for funding. Those include introductory videos on AI and machine learning, coverage of data sources and the responsible use of AI and links to open source tools, including TensorFlow.